A couple of years ago, a piece by El Anatsui stopped me dead in my trek through MOMA. I didn’t know who he was, or the significance of the piece…..only that it grabbed my attention. It was Bleeding Takari II, a huge, shimmering wall hanging. 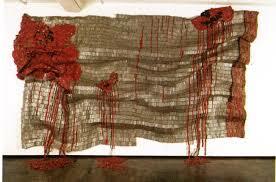 Susan Vogel’s excellent documentary Fold Crumple Crush: The Art of El Anatsui increased my interest in Anatsui’s art. Click here for a brief trailer of the film. The Art Caravan had the good fortune to see the travelling exhibition, Gravity and Grace: The Monumental Works of El Anatsui at the Museum of Contemporary Art San Diego. It was a perfect setting for the works, as the Downtown location is in the historic Santa Fe Depot Baggage Building, a cavernous space with natural light. Look closely at the work. (Click on the images for better viewing.) It is composed of recycled materials, often woven together with copper wire. I admire how the microscopic pieces, beautiful and full of history, combine to create a macroscopic work of art. It’s no wonder El Anatsui is considered the foremost contemporary African artist. This entry was posted in Contemporary Art Museum, El Anatsui, Susan Vogel and tagged El Anatsui, Museum of Contemporary Art San Diego, Susan Vogel on March 27, 2015 by terryvatrt. I’ve been (slowly!) reading John O’Dnonhue’s book Beauty: Rediscovering The True Sources of Compassion, Serenity and Hope. I love what he says in the chapter entitled “The Colour of Beauty” …. We dwell between the earth and the air, guests of that middle kingdom where light and colour embrace. I’d say we’re pretty fortunate. This entry was posted in Beauty, Colour, John O'Donohue and tagged beauty, colour, John O'Donohue on March 2, 2015 by terryvatrt.